The U.S. Consumer Product Safety Commission in cooperation with Big Ideas Marketing, of Owings Mills, Md. , today announced a voluntary recall of about 8,800 units of Horse-on-a-Stick Toys. 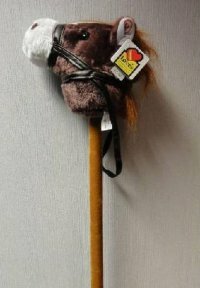 The reins on horse-on-a-stick toy’s bridle are long enough to form a loop around a child’s head and neck, posing a strangulation hazard to young children. CPSC has received one report of a near strangulation involving a 2-year-old boy who became entangled in the reins at his neck.The boy’s mother freed him without injury. The products were sold at Love’s Travel Stop and Country stores nationwide from May 2010 through July 2010 for about $6. The toys were manufactured in China.